This year Let Us Shine Girls Academy was, for the first time, invited to take part in the annual district girl’s football competition. 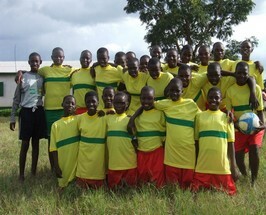 Aided by their sports teacher and other staff, the girls trained hard for over a month leading up to the event. On the day our team were up against eight others made up of girls from surrounding schools. Our players were supported by all the Let Us Shine students, who sang and said prayers as they watched their team get into the final.